It is often rumored, that Apple Computer, Inc. took initial inspiration for the Lisa (cf. 3.1.8) and Macintosh (cf. 3.1.9) projects from a visit at Xerox PARC. This visit did actually happen in November 1979, but proposals for Lisa and Macintosh are dated respectively to October 1978, and May of 1979. A demo of Smalltalk was given to Apple’s engineers that consolidated their understanding of a graphical user interface with windows, menus and the mouse as graphical input device. Another important influence for the Lisa team was MIT’s Spacial Data Management System. The way Lisa, and later the Macintosh user interface deal with spacial arrangements of icons has their roots in SDMS Dataland. 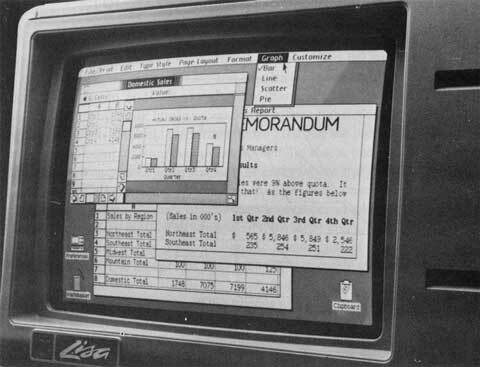 The Lisa was presented in 1983 but like the Xerox Star before the Lisa was not commercially successful. The interface concepts were too ambitious for the performance for the hardware of that time. Apple Lisa is much more than just a computer between Xerox Star and Apple Macintosh. In fact the development of Lisa was almost independent from Xerox Star and evolved parallel to Apple’s Macintosh project. The Lisa computer is assembled to fit into the same case as its 12 inch monitor. The screen has 720 by 364 pixels with a horizontal resolution of 90 DPI [Schreiber 90, p. 291]. The small vertical resolution of about 60 DPI is caused by rectangular pixels. Some psychological experiments had indicated, that the horizontal resolution is more important for legibility than the vertical value [Friedewald 99, p. 382]. The final design of the mouse has just one button. It was quite vividly argued about the correct number of buttons. «What ensued became known as the “button wars”», recall Roderick Perkins, Dan Keller, and Frank Ludolph in Inventing the Lisa user interface [Perkins et al. 97, p. 46]. Several user tests and the aim to make the system easy to use for naïve office employees lead finally to the decision of one button. Lisa is equipped with 1 MB RAM, a 5 MB harddrive, and a powerful 5 MHz Motorola 68000 processor. The capabilities of the processor strengthened the impression of the design team, that «the Lisa would be so fast that it would be waiting on the user most of the time! The idle time could then be used to drive a more elaborate user interface» [Ibid., p. 44]. How are documents created or destroyed? How are they returned to their filing homes? How should their attributes be displayed? Bill [Atkinson] adapted this idea to the filing problem by creating an enormous virtual desktop, perhaps a mile square, and then providing methods for very quickly moving around and zooming in or out. Documents were represented as small icons that could be organized spatially, with related documents placed near each other. This attempt was rejected, because it didn’t fit into an office environment. It was compelling for technicians but not easy to understand for novice users. What remained was the appreciation for spatial quality. The final design of the Lisa Desktop Manager uses icons for documents and folders. It introduces the trash can for the desktop. Icons can be moved with drag & drop to folders or to the trash can, where they remain before they are finally deleted. This supports a feeling of confidence for the user that all filing operations can be undone. Since users never saw both document icon and window at the same time, a window was perceived as just a form of presentation, not as an independent object with its own edit state. A Xerox Star document can contain all datatypes collectively. Especially text and image can be freely arranged and edited in place. Unfortunately this advantage for the user causes a closed software architecture. It is a problem for third parties to develop programs that interact seamlessly with the existing programs and documents. Lisa on the other hand has an open software architecture. Apple offers documentation how to utilize the Desktop Libraries for custom development. Also a style guide entitled Lisa User Interface Standard was written in 1980 in order to achieve a consistent “look and feel” among all Lisa application programs [Friedewald 99, p. 387]. Lisa introduces the menu bar with pull-down menus. The bar is located at the top edge of the screen (cf. Fig. 3.12). It is shared between Lisa programs, that hook their commands into the structure of the menu bar. Some frequently used commands can be selected with a keystroke combination out of a special Apple command key together with a character – e.g. ’ D’ duplicates a document. Fig. 3.12. Apple Lisa, 1983. Menu bar on top of the screen. The “Wastebasket” is bottom left. The Lisa has a document-centric user model. That means that the user should not notice anything about application programs. They are called tools and reside somewhere on the hard disk – but that’s all. It is even not possible to launch a tool directly. They get called automatically by the Desktop Manager if the user wants to open an associated document. Tools are also terminated by the Desktop Manager if the document is closed and another tool needs memory resources. Consequently tools on Lisa have no QUIT command. Saving a document is an uncritical action, as the Lisa system continuously saves all changes to an invisible ’suspend’ file. The user can be sure that everything is kept by the system, even if she is interrupted by a different task. Documents can be temporarily set aside without the need to save them. In this case an icon remains on the desktop, that can be called up at any time to open the document in the same state. Finally if the user decides to close the document a modal dialog asks whether the changes should be saved permanently or not. The following table is based on Arthur Naiman’s Introduction to the Lisa [Naiman 84]. It should convey an impression of available operations for documents on the Lisa system. The Open command reflects the name of the currently selected item. Tab. 3.1 Lisa’s File/Print menu for the Desktop Manager (left) and LisaWrite (right). […] to finish a work session with the Lisa […] all you have to do is … turn the machine off. It doesn’t matter whether you’re in a window or on the Desktop–the Lisa saves onto the disk all the changes you’ve made to any document. […] The Lisa also remembers what windows were open, their size, shape and location on the screen, etc., etc. When you turn the Lisa on again, it puts you back in exactly the same place, so you can begin working right where you left off. This very impressive behavior of a system that is nearly twenty years old can only be compared with the sleep mode of modern PCs. The estimate that the 68000 processor was powerful enough for this sort of interface turned out to be false. Interacting with the Lisa required a lot of patience. Annette Wagner shares her original font and designs for Apple Lisa. Apple Lisa commercials with Cevin Costner | alternative on YouTube "Two kinds of people..."